Some five years ago, the organisers of the annual Interclassics & Topmobiel show in Maastricht, the Netherlands ramped up their efforts to the turn the event into the leading classic car event in the BeNeLux (Belgium, the Netherlands and Luxembourg) area. Also helped by the prime location on the border with Germany and Belgium, the three-day show has certainly grown in quality and stature, underlined by the record visiting numbers in 2013, breaking the 20,000-visitor number for the first time in the event's history. To accommodate for the increased interest, the available floor had been increased by 10% for the 2014 edition by adding a temporary pavilion, which housed and additional 40 auto jumble type exhibitors. 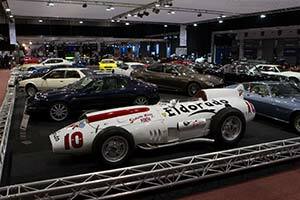 The rest of the MECC Maastricht exposition centre was filled with classic car dealers, clubs, memorabilia and books vendors, a Coys auction and special displays. Most impressive among these was the Maserati 100th anniversary celebration organised by the Maserati Club The Netherlands. In 2014, our photographers visited Interclassics & Topmobiel for the first time in some years and their impressions can be found in this 80-shot gallery. 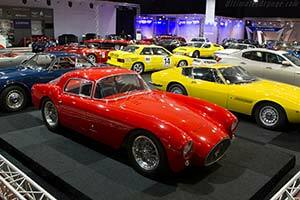 Maserati's 100th anniversary celebrations will no doubt be a major feature in many of the events to come in this year but Interclassics & Topmobiel certainly got the ball rolling in prime fashion. Brought together by the Dutch Maserati club, the special display featured well over two dozen prime examples representing all the major periods of Maserati's history from one of the very early Tipo 26 competition cars all the way through to the latest Ghibli. Also on display were an OSCA, designed by the Maserati brothers after they left the company they established in December of 1914, and also a Citroen SM, which is powered by a Maserati V6. One of the major contributors was the Panini Museum in Italy, which today houses the former factory collection. Among the fantastic machines they brought was the achingly beautiful A6GCS/53 Pinin Farina Berlinetta and the unique 420/M/58 Eldorado, which was raced by Stirling Moss in the 1958 Race of Two Worlds and remains the very last single seater racing car produced by the Italian manufacturer. 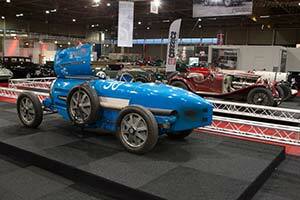 Other rarities on display were a Barchetta competition car, which is still regularly driven and a 250 F 'Piccolo', both brought by Dutch collectors. Among the many other highlights was a display of classic competition cars assembled by the popular publication 'Pre War Car'. In addition to more familiar but nonetheless very impressive machines like a Bugatti Type 54 and an Alfa Romeo 8C 2300, the line-up also boasted much rarer racers like a Rolland & Pilain and a D'Yrsan. Certainly also hard to miss was the unique Volpi Special finished in the Argentinian racing colours of bright blue and yellow, and powered by a massive Cadillac V16 engine. Barn-find specialist Joop Stolze caught our attention with a trio of beautifully preserved Abarths, including a Sestriere and a Mono Mille. Possibly found in a chicken coop was a Talbot Lago T26 Record, which was displayed with a nest and a fake chicken 'still' in the car. Another absolute highlight was a one-off Alfa Romeo 1900C SS clothed by Boano. This car was Boano's take on the Disco Volante style and featured an impressive split wraparound rear window. In addition to these rare and unusual machines, the event also offered a full spectrum of classic and even more moderns cars to enjoy like a choice of Mercedes-Benz 190 SLs but also a McLaren P1 brought by Louwman Exclusive. An hour before the show officially started on Friday morning, there was already a line of people trying to get in and even after the doors had already been open for an hour, there were still hundreds of enthusiasts queuing to get into the MECC Maastricht. It was clearly a sign of what was to come as the 2013 record was smashed as 27,974 spectators visited the 2014 edition. Thanks to the diverse and interesting displays, they will certainly have enjoyed the event. Perhaps the show will have to open on Thursday in 2015 to cope with the ever increasing spectator numbers!